In 1519 the Spanish conquistador Hernán Cortés arrived in the area of the Puebla-Tlaxcala valley and from there set out with his troops for the capital México-Tenochtitlan. Cortés established various commercial ties in the region with the people of the Huejotzingo dominion and set up an encomienda [labour-tribute system] in the village of Calpan, which belonged to Huejotzingo. The encomienda was passed to the conquistador Diego de Ordaz in 1530, whose descendants continued to benefit from its tributes until the late 16th century. Immediately after the arrival of the conquistadors the first missionaries appeared in the area, where they began to construct religious buildings. In 1548, for example, work started on the construction of the Franciscan monastery of San Andrés in Calpan, under the direction of Friar Juan de Alameda, who was also responsible for the monasteries at Huejotzingo and Huaquechula. The architectural style of the monastery is a mixture of Spanish architecture, with a typically Plateresque façade, and ancient, indigenous techniques and methods, for example the use of quicklime, bees’ wax and prickly pear mucilage in the building materials. Following the completion of the monastery the parish church of San Andrés was constructed in the 17th century, receiving the visit of Bishop Juan Palafox y Mendoza in 1644. 1 Palafox was bishop of the region of Puebla and also acting viceroy. His desire to manifest his political and religious authority led him to commission numerous painted and engraved portraits of himself, thought to number around 3,000. 2 This can be related to a context in which, with the increasing organisation of Spain’s South American dominions following the conquest, a political, social and religious elite came into existence that wished to express its status and importance in an overt manner. This was often done through portraits, in which the sitters were more interested in manifesting their status than in a lifelike depiction. One of the artists commissioned to produce portraits for galleries of prominent individuals and who also executed series of episodes from religious history was José Rodríguez Carnero, or de los Santos (1649-1725), as he signed some of his works, including The Dream of Saint Joseph in the Museo Nacional del Virreinato in Tepotzotlán. The son of the painter Nicolás Rodríguez Carnero, whose second surname he adopted following his father’s death in 1677, 3 his first known works are the portraits of Palafox (now lost) and of the Archbishop of Mexico, Friar Marcos Ramírez de Prado, now in the metropolitan cathedral. Around 1684 Rodríguez Carnero moved from Mexico City to Puebla where he became one of the most important local painters, together with Juan de Villalobos, Cristóbal Talavera and Antonio de Santander. Surviving works by the artist include nine canvases for the chapel of the Rosary in the church of Santo Domingo of around 1690; the allegory of The Triumph of the Jesuits and Jacob’s Ladder in the sacristy and choir of the Jesuit church, respectively; and three signed canvases for the church of San Diego de Alcalá in Huejotzingo. One of the latter, which depicts Saint Diego’s Corpse performing a Miracle, has the inscription: “A devoción del Sr. Lizdo. Dn Pedro de Carranza Olarte, Cura por su Magestad, de esta Ciudad, de huexogo”. 4 Depicted in the lower right corner is the patron of the work, the parish priest Pedro de Carranza Olarte, who is the figure depicted in the present drawing. Pedro de Carranza Olarte y Gaztelu was the parish priest of the church of San Andrés in Calpan where he also acted as the local judge. Of Basque origins, earlier members of his family had taken part in the conquest of Mexico. 5 The above-mentioned canvas of Saint Diego is signed “Carnero, ft” and the date on it has until now been read as 1604. However, the dating of the present drawing, executed in 1693, and the dates when José Rodríguez Carnero is known to have been active (between the last third of the 17th century and his death in 1725), 6 suggest that the date of the painting should be read as 1694. This is also indicated by the appearance of Pedro Carranza in both works, in which he is shown at the same age and in exactly the same way. Given the similarity between the two portraits, their chronological proximity and the relationship that must have been established between the sitter and the artist, it can be suggested that Rodríguez Carnero was responsible not only for the canvas of Saint Diego but could also have executed the present drawing. For the moment, however, no other drawings by the artist are known that could allow for a stylistic comparison which might corroborate this suggestion. The format of the portrait follows the model established in the early galleries of portraits in 16th-century Hispano-America and which is also to be seen in the portraits of Palafox and Ramírez de Prado. 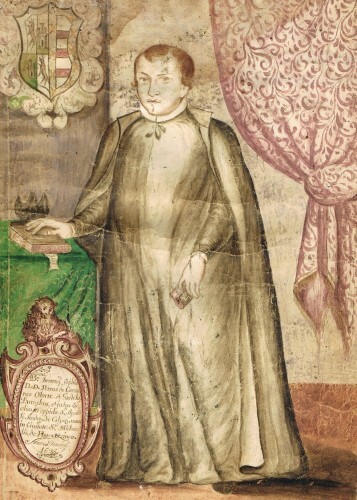 The sitter is shown standing with a curtain behind him, accompanied by his coat-of-arms and an oval cartouche to one side that identifies the person portrayed. Finally, there is a table with various items on it that refer to his social status. 7 The portrait thus corresponds to the format used for sitters of social prestige at this period and no innovative elements are introduced. The axis of the composition is created by the figure of Pedro de Carranza, who is depicted full-length, wearing a cassock, a clerical collar and a black cloak. In his left hand he holds a small book that is probably a missal, while his right hand rests on another book in a pose that seems to refer to his position as a judge. The setting is a room framed on the right by a gold-fringed, red curtain with a decoration of foliate motifs and on the left by a wall. On the upper part of the wall is the sitter’s coat-of arms in the form of a quartered shield with a decorative Baroque, curling surround. The left quarter has the arms of the Carranzas, represented in the quartered field by a rampant wolf on argent and a castle on vert. The right quarter encloses the arms of the Olartes, with a quarter of crosses and another of bars, gules and argent. Immediately below the coat-of-arms is a table covered with a green cloth with gold embellishment. On the table are objects referring to the sitter: a biretta and what appears to be a legal book on which he rests his hand. Finally, at the lower left is an oval cartouche that is elaborately ornamented with rocailles and has a lamb at the top. It bears an inscription in Latin that refers to the sitter’s positions as the parish priest of the church of San Andrés in Calpan, Huejotzingo, and judge of that locality. It also includes the date of the drawing: 1693. The singularity of the present work lies in the fact that it is a drawing not produced as a preliminary study for a larger oil painting but as a finished work. This is evident from the use of polychromy, the detailed, painted decoration of the curtain and the use of gold to add greater richness to the decoration of some elements. Most surviving portraits from the viceroyalty of New Spain are oils, particularly those executed in the 18th century. As a result, it can be said that this drawing is an exceptional example that points to the production of portraits on this type of support and to the interest on the part of the less elevated social classes in presenting themselves in the manner of the great aristocrats, viceroys and bishops. Palafox y Mendoza (1997), p. 57. Ruiz Gomar (1997), p. 63. García Granados & McGregor (1934), p. 287. Azcona Pastor (2004), pp. 34-35. Rodríguez Moya (2001), p. 80 and Rodríguez Moya (2009), pp. 27-28.